There is still the impression in the community that large amounts of financing will be needed to cash in on the numerous AC35 business opportunities. 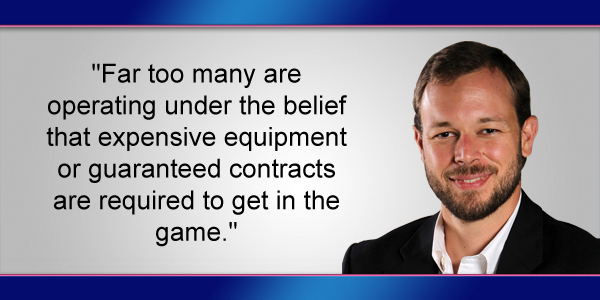 Far too many are operating under the belief that expensive equipment or guaranteed contracts are required to get in the game. However, there are a great number of small business opportunities that should require minimal overhead. As such, the BEDC has been preaching the bootstrapping approach to entrepreneurship with our Ice House program for the last 2 years. The Cup will be here for a short window, and it will be here soon. Accordingly, there is a need for businesses to get started with planning and financing. The volume of demand will be eye watering, and businesses will be able to get paid back before the end of the Cup. The following cases, which came up at the 6 “Local Biz Opps” public meetings held during the last month, can be easily resolved with an entrepreneurial mindset and a bootstrapping approach. Ice: It is estimated that the need for ice will be something substantial like 160k bags of ice per day. Buying an ice machine to handle this volume would cost a lot, and it would need to be shipped in and probably back out. Why not instead buy a refrigerated container full of loads of pre-bagged ice? People could come to you, or delivery could be added to the business offerings. Other costs may be getting a few electrical plugs installed and renting some space to unload the containers. Laundry: There are many laundromats that might be interested in servicing the increased volume. They may be interested in offering their facilities to an entrepreneur to lease out to run night shifts. Collection and delivery would be a separate service that could be offered internally or by partnering with another entrepreneur. On-site services: Many existing businesses or at-home service providers can massively expand their market by offering services to the many yacht and hotel guests: barbers, beauticians, baby-sitters, personal chefs, pet-grooming, etc. The business plan must service an America’s Cup market demand. The business plan must show that the loan/investment can be paid back prior to the end of the Cup. Exceptions may be made if a compelling argument is offered that the business will continue to service a local need at post-AC35 levels of demand. Take note that many of these opportunities require little to no business experience, capital or equipment to deliver successfully. Once you know you intend to service an AC35 related need, email info@bedc.bm, visit us online at www.bedc.bm or call 292-5570 to start the Microloan process. You can and should also register your interest to service a Cup related need directly with the ACBDA at localbizopps@acbda.bm. Garbage to smooth and appease the general public. There are no free, walk-in, turn-key business for anyone. You have to have the desire to work for it! If you don’t want to put in the effort, it won’t be given to you! Well if the general public listened to you they would need to be appeased. Go buy a container of ice and mark up each bag by $2. Enjoy your time sitting on the wall letting this event pass you by. Doubt if those making an effort to help themselves will have time to even wave to you as they hustle along. Wow!! What negative attitudes! Truly folks living out the old adage “you can lead a horse to water but you cannot make him drink.” The opportunities are there, and there folks claiming to be hungry. Somebody is fronting.